With the FastATA 1200 MK-III controller you can now take advantage of the latest low-cost, high-capacity ATA/EIDE devices like hard drives, CD-ROM drives, CD-RW drives, ZIP drives, LS-120 drives, etc. FastATA 1200 MK-III is a successor of the award-winning FastATA 1200 controller. The new controller offers enhanced performance with lower processor load when compared against earlier version. The minimum hardware configuration is: Amiga 1200 in a desktop case with a 4MB RAM expansion card. The recommended configuration is: Amiga 1200 in the Mirage 1200 tower case, any 68060 (or PPC with 68060) turbo card with 32MB RAM. The FastATA MK-III controller with its maximum transfer rate of 16.6MB/s in the PIO 4 mode offers huge capacity reserve for fast mass storage devices, especially for fast hard drives. Therefore, applications may run much faster if they can have fast access to large data files. The FastATA 1200 MK-III controller implements the ATAPI standard as well, for use with devices like CD-ROM, CD-R, CD-RW, ZIP, LS-120, DVD drives. 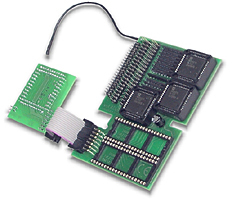 This enables connection of ATAPI-standard devices to the Amiga with no need of installing additional software. The controller operates with two EIDE ports, which enable installation of up to 4 IDE/EIDE/ATAPI devices. Both controller ports are fully buffered and terminated in accordance with the recommendations set forth in the ATA-3 specification. Compatible with PIO-0, PIO-3, PIO-4, ATA/33, ATA/66, ATA/100 ATA/133 devices. eliminated in the FastATA 1200 MK-III controller. The FastATA 1200 MK-III controller may be used with >4GB HDDs independently of the installed filesystem. The 48-bit LBA (Logical Block Addressing) capability assures support for hard drives beyond the 137GB (up to 2TB). The controller automatically recognises any device attached to it, negotiates the highest possible data transfer rates, switches the device into its appropriate mode and transfers data at the maximum transfer rate. The FastATA 1200 MK-III controller automatically detects type of processor and optimises and modifies some software routines in order to achieve the highest possible data transfer rate between the controller and the computer memory. The computer recognises the controller as a 32-bit device configured in the motherboard IDE port space. Full 32-bit operation of the controller combined with very efficient software guarantee significant increase in the speed of your computer. The FastATA 1200 MK-III controller is compatible with all the major A1200 turbo card models and memory expansion cards. The FastATA 1200 MK-III controller is designed for use with the following turbo cards: Blizzard PPC/060, Blizzard PPC/040, Blizzard 1260, Apollo 1260, Blizzard 1240, Apollo 1240, Blizzard 1230 (III, IV), Apollo 1230, GVP 1230, Elbox 1230 and M-Tec 1230. For FastATA 1200 benchmarks with most popular A1200 turbo cards check FastATA 1200 speed test page. The FastATA 1200 MK-III controller has been designed to fit inside the Amiga 1200 in its standard case or in any Tower-type casing. The FastATA 1200 MK-III controller has to be installed on the Amiga 1200 motherboard. The two boards that constitute the controller are inserted in the ROM sockets and on top of the GAYLE chip. All installation steps are shown in the FastATA 1200 Quick Installation Guide. The FastATA 1200 MK-III controller is available with a standard software pack including FastATA'99 software. The FastATA 1200 MK-III pack includes also the fastest Amiga CDfilesystem -- Allegro CDFS. Info on the current software versions is available in the DOWNLOADS | FastATA section. FastATA 1200 MK-III controller Suggested Retail Price (VAT and local taxes excluded): see Product Price List.